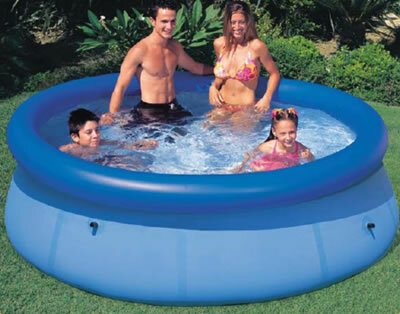 Perfect for home use, the 8ft Easy Set Pool is suitable for smaller children & families making their first pool purchase. Easy to set up – no tools required. Liner is supported by inflatable top ring whilst the pool goes up by itself as the water level rises. Pool has convenient drain plug for easy emptying. Side walls are made with 3 separate layers of material for extra strength & durability – 2x outer layers of heavy gauge PVC laminated to an inner layer of polyester mesh for extra reinforcement. Pool water capacity (80%) is 532 gallons or 2420 litres. Instructions & repair patch included.